Accorhotels has opened two new hotels in New Delhi Aerocity, close to Delhi International airport. 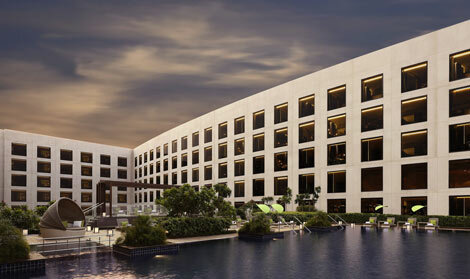 Pullman New Delhi Aerocity and Novotel New Delhi Aerocity have a combined 670 rooms and offer easy access to the business hubs of Gurgaon and New Delhi. The Pullman hotel is the brand’s 100th globally and was designed by Meriem Hall, a Singapore-based designer “who has flooded the hotel with bright peacock colours and plush décor”. Guestrooms are soundproof while facilities include a spa and several restaurants including Pluck, a modern European restaurant and the amusingly-named Honk, an Asian bistro serving street food from across south-east Asia. Convention space comprises of 13 co-meeting rooms, three boardrooms and a business centre. The Pullman and Novotel hotels have one of Delhi National Capital Region’s largest convention spaces, spread over more than 3,720 sqm with a pillar-less ballroom measuring 1,180 sqm. Pullman New Delhi Aerocity and Novotel New Delhi Aerocity have been developed as a part of a strategic and joint partnership between InterGlobe Enterprises, APHV India Investco and Accorhotels. Accorhotels now has seven brands in India, with over 30 hotels in total.